A monument in the village of Bird’s Hill, in the Rural Municipality of East St. Paul, commemorates the Winnipeg Silver Fox Farm, which from 1922 to 1970 raised silver foxes here as a source of fur. The surrounding land was originally owned by Curtis James Bird. 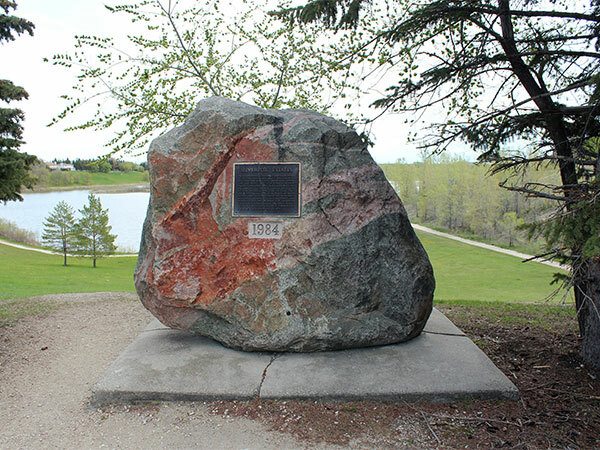 In the early 1870s, it was purchased by the Canadian Pacific Railway and subsequent users have included the CPR, City of Winnipeg, Building Products and Bird’s Hill Grave & Stone Ltd. A quarry supplied railroad, road and building materials for over 100 years. It has been restored and rehabilitated for use as a residential neighbourhood. “Manitoba’s fur industry forges ahead,” Winnipeg Tribune, 9 December 1933, page 44. MHM Silverfox Estates - Birds Hill MB, Waymarking. This page was prepared by Peter McLure and Gordon Goldsborough.